Mobilink P60 II - Print anywhere, anytime! The Mobilink P60II offers the fastest printing in its class with speeds up to 100mm/second. Compact and light weight, it has an industry-leading battery life, flexible connectivity, a ruggedized design to ensure reliability in even the harshest environments and more. And it supports all the leading mobile operating systems including iOS, Android and Windows. Best suited for: Retail, Hospitality and Food service. Ensure uninterrupted service to your customers, with battery life of up to 14 hours with 802.11 models and up to 46 hours with Bluetooth models*. The only wireless printer that comes with paper-saving options that can reduce your paper usage by up to 23%. Fast and easy integration, and supports all leading mobile operating systems including iOS, Android and Windows with 802.11 and Android and Windows with Bluetooth. 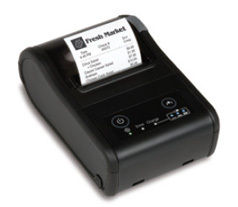 Compatible with today’s best-of-breed and component-based POS systems and the latest industry-standard wireless security protocols.